Delphic Oracle is a product of Zoidiasoft Technologies, and is the only astrological software endorsed by Project Hindsight. 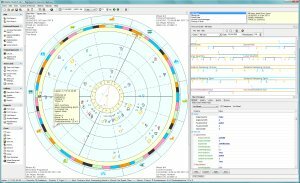 This software is based upon Robert Schmidt's reconstruction of the System of Hermes and is designed to meet the needs of astrologers who wish to use the ancient techniques of hellenistic astrology to investigate birth charts. Most of this program is completely unique, containing extended abilities not found in any other program in the world. Delphic Oracle has a very modern interface and has a large array of features such as hi-resolution printing, Adobe Acrobat file generation, various time lord systems, an html web reporting tool, a transit animator, an interactive graphic ephemeris, chart designer, reports for arabic parts / greek lots, eminence indicators, and various specialized “wizards” to aid in navigating through various Hellenistic techniques such as predomination arguments, identifying overall chart rulers, and so forth. Recent additions to the program include aspect and testimony lines based upon the Antiochus aspect doctrine, chart database that is searchable, a chart designer that allows up to five wheels to be configured for transits, progressions, directions, etc. For more information, see the astrology software page on Zoidiasoft’s website. Circumambulation through the bounds / confines according to Ptolemy and Dorotheus. It is similar to primary directions, but the ancients used these procedures as a way of defining the general periods of life. Circumambulations figure prominantly in many of the procedures for determining length of life. Method of Decennials according to Valens and Hephastio. Another general time lord method (general methods look at the life as a whole, whereas topical methods focus on a given area of life such as marriage, children, career, etc.). Quarters of the Moon method according to Valens. This is an analog of Decennials, but is based on the prenatal lunation (the full or new moon preceeding the birth). The 129 year system of the Egyptians. Another general time lord procedure. Schmidt thinks this might be an idealized version of the Balbillus procedure (see below). Exaltation period reduction method of Balbillus. This method proportionally reduces the length of the circular period according to how far a planet is from it's exaltation degree; such that if a planet is in the degree of its fall, then the period is 1/2 of its circular period. This is another general time lord method. Lunar Monomoiria method of Critodemus. This is probably a topical method used when the Moon is chrematistikos. This is based upon what degree the Moon is in at birth and each successive degree is given a specified number of years. Zodiacal Releasing from Fortune, Spirit (or user defined). This is a topical method found in Vettius Valens that looks at matters pertaining to health and well being when releasing from the Lot of Fortune, and to career, reputation, and willful actions in general when releasing from the Lot of Spirit. Easy birth chart setup with Asc & MC calculated before display, with 15 house systems and 30 pre-defined zodiacs and user defined zodiac (tropical and sidereal) to choose from. Swiss Ephemeris level accuracy. Delphic Oracle uses the Swiss Ephemeris, one of the most accurate planetary calculation engines in existence, and has a range of 10,110 years (can calculate birth charts between Jan 1, 4713 BCE - Dec 31, 5,399 CE). Programmed access to the Terran Atlas with over 13 million locations and access to the Olson time zone database. Online help files. Delphic Oracle comes with help files for practically every situation you will find yourself in while using it. Just press the <F1> key.